Act + Acre is the first modern hair wellness brand that encourages you to 'treat your hair like you treat your skin'. The cutting-edge, vegan, natural hair-care line is sulfate, silicone, paraben, gluten and cruelty-free and environmentally friendly. Founded by husband-and-wife team Helen Reavey and Colm Mackin. Originally hailing from Ireland, Reavey has funneled her expertise as a celebrity stylist into the scalp-first collection. 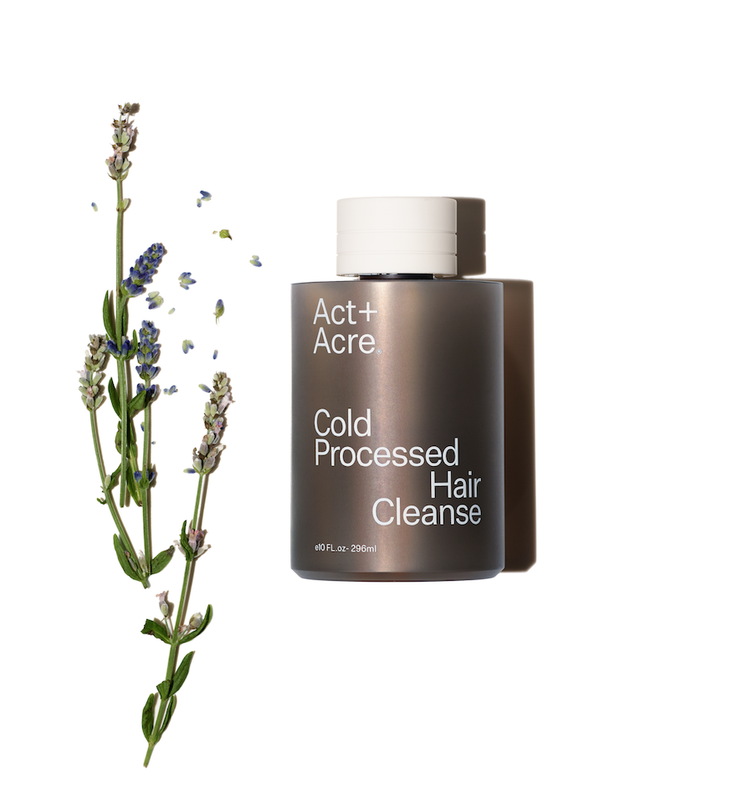 Act + Acre launched with three essential Cold Processed products: Hair Cleanse, Hair Conditioner and their hero product, the Scalp Detox, that deliver nutrients to your scalp and strands without any harsh chemicals that can strip away the healthy oils our scalp needs impacting quality of growth. The founders created the patented cold-process technique to create their plant-based products, skipping the traditional heat-based production, which can lessen the potency of ingredients and performance, and not to mention uses 90% less energy during production. Act+Acre is disrupting the haircare industry with cold-process technology. Since the invention of the haircare industry, companies have been using heat and chemical emulsion to formulate their products. Formulas reach up to 150 degrees Fahrenheit, which can destroy the potency of active ingredients and reduce effectiveness. Act+Acre reinvented the process from scratch to create formulas and a proprietary production method that is better for you and better for the Earth (it uses 90% less energy in production!). Act + Acre truly is a zero-waste beauty brand. The brand is cutting-edge, vegan, natural and it’s sulfate, silicone, paraben, gluten and cruelty-free and not to mention environmentally friendly, so there's *zero guilt* about adding it to your self-care, beauty routine. The brand’s ethos is heavily focused on sustainability so yes, the packaging is totally recycled and is also PETG1 which means that we will be recycled again. You can recycle your bottles because the brand uses the most recyclable form of plastic on the market, Polyethylene Terephthalate. Each product is more amazing than the last. The cold processed hair conditioner delivers nourishment and moisture to the hair cuticle. Rich in natural oils, it leaves your hair hydrated and soft. The cold processed hair cleanse is antioxidant-dense and helps to re-balance, while delivering nourishment and moisture to your scalp and hair. This gentle formula also aids in fighting free radical damage. Finally, the scalp detox removes the build-up of products and pollution, delivering nutrients to the hair follicle. It aids in stimulating and balancing the scalp, leaving it feeling nourished and moisturized.